Remember the popularity of the track-suit pant in the nineties? Well, track pants are back and stronger than ever. In fact, this trend has been hanging around for many seasons and will continue to be popular in 2018. Track pants are no longer reserved for athletes only. As the street-style world has shown us in the past few years, it’s an effortless and casual look that adds instant coolness to your style. They look chic paired with everything from a T-shirt to a dressier blouse. Many fashionistas love to match them with a leather or bomber jacket and any type of footwear works well with these pants. How and where you wear them is up to you. Though keep in mind, it’s always best to dress appropriately for every occasion. This trend is so easy and playful, that you will find the right occasion to give them a try! For a simple and relaxed look, go ahead and pair your track pant with a trendy sneaker and a casual sweater. 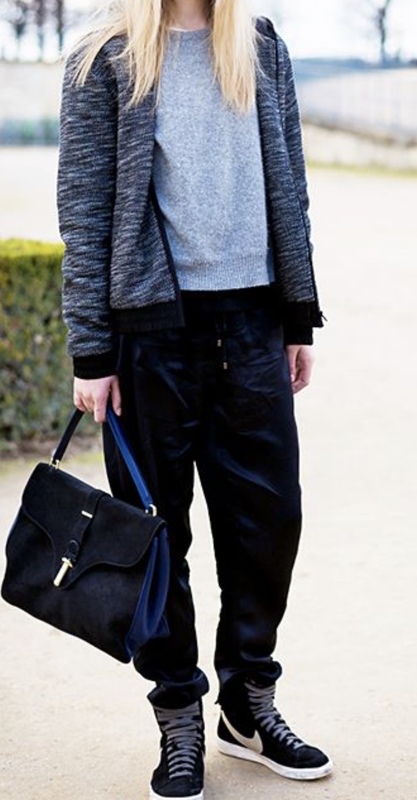 Add an oversized shoulder bag with a bomber jacket and you are good to go and run errands in style. Yes, track pants can be dressed up. First, look for a slightly dressier pair in a light crepe fabric. Pair them with a high heel and a button-down top. Add a fun bag and you have a polished look that is appropriate for a date-night or a night in a city. Gorgeous! I love to wear these pants. These pants are so comfy and provide a stylish look. Thanks for sharing. Thank you for your feedback regarding my blog on track pants. This trend is so easy to incorporate into your wardrobe at any price point and I’m loving the variety that retailers are providing. Thanks for reading!